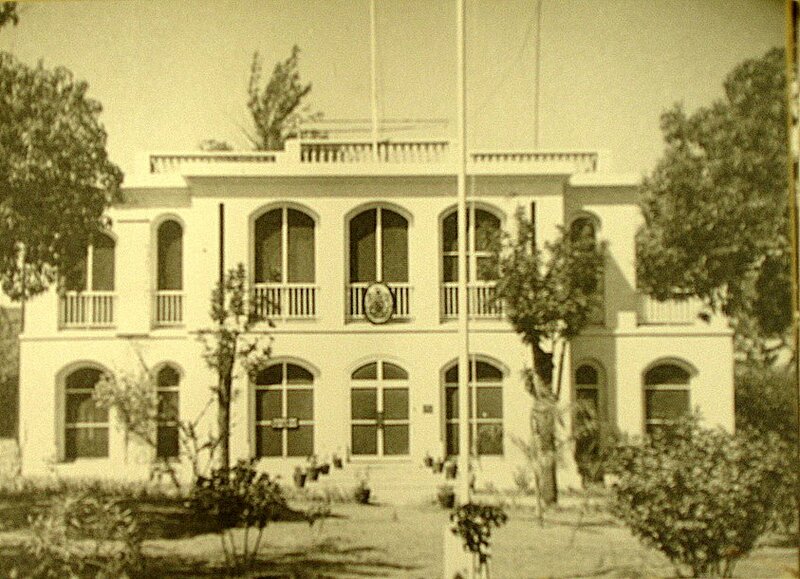 The first consulate was established in 1873, in a leased house on the small Island of Mozambique, then the capital of Portuguese East Africa. Henry O’Neill, who arrived as consul in 1879, liked the house so much that he bought it himself in 1883 and remained the consulate’s landlord after he left Mozambique in 1884. In 1891, by then the consul at Leghorn, he sold the house to the British government for £1,500 and it continued to serve as a consulate on the Island of Mozambique until 1900. In that year, it was leased to the local Telegraphic Cable Company, and was eventually sold to the French government in 1915. The Island of Mozambique was gradually eclipsed as the country’s capital by Lourenço Marques, on the coast near the southern tip of the country of Mozambique, over 1,000 miles south of the Island. Lourenço Marques was founded in the late eighteenth century but grew rapidly during the 1890s when a railroad connecting it to Pretoria, three hundred miles inland to the west, was completed. It became the formal capital of Portuguese East Africa in 1898, and its name was changed to Maputo upon independence in 1975. (It had sometimes also been known as Delagoa Bay, the former name of Maputo Bay.) Mozambique joined the Commonwealth in 1995. I am indebted to a correspondent for putting me straight on the location of the first consulate in Mozambique: he has his own website at http://housesofmaputo.blogspot.lu/2018/03/consulado-britanico-em-lourenco-marques.html . 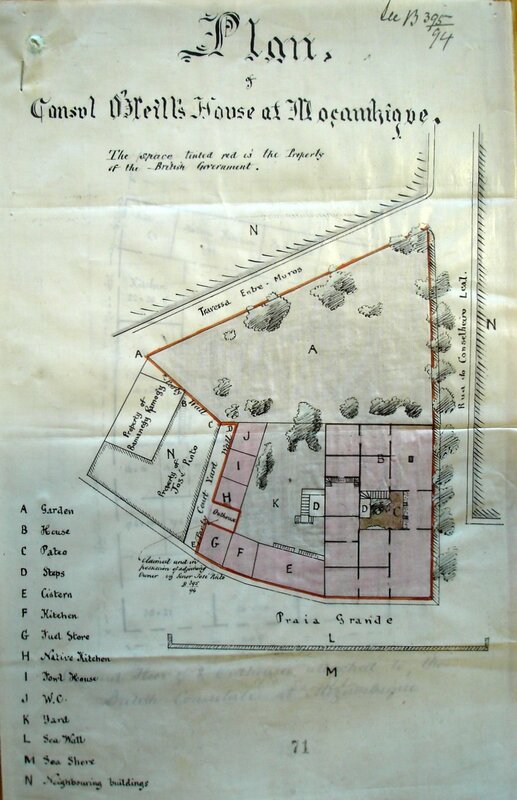 Siteplan of O’Neill’s consular house on the Island of Mozambique, 1894. Consulate on the Island, , 1894. The growth of Lourenço Marques created the need to establish a vice-consulate in the city, answerable to the consul on the Island. To this end, a site, of 3,500 square metres on Avenida Castilho, was bought in 1891 on which to build a house for the vice-consul. The vendor was Frederick Ernest Widmer, whose doctor had told him that his extreme ill-health could only be ameliorated by leaving Mozambique immediately: he therefore sold his site to the British government at a bargain price of £400. The consul proposed the design of a residence to London. Robert Boyce, the Office of Works’ principal architect/surveyor for overseas projects, describing it as ‘very faulty’, pulled it into shape without any objections from the consul. The contractor was a Mr Blackwood and, to reduce the cost, a long list of materials and fittings was supplied from Britain. Construction was completed in 1895, for about £5,000. The house was nevertheless under-designed and badly built and took years to put right: at one stage it was even going to be sold. It is unclear in which year the consul himself moved to Lourenço Marques, but certain that it was before 1900, when the Island consulate was sold. At the Treasury’s suggestion, the Lourenço Marques consulate was administered by the Transvaal government from 1904-08. 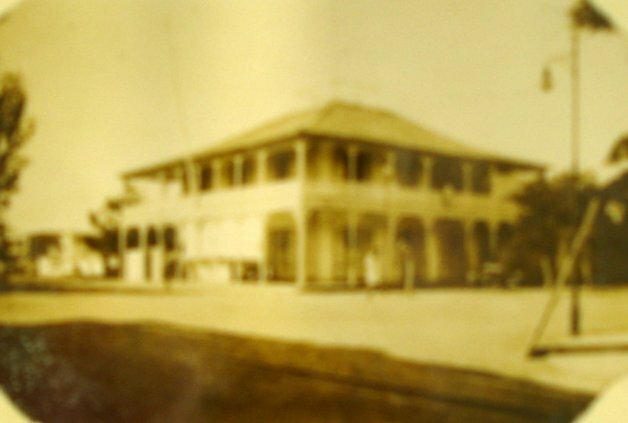 An architect from the Department of Public Works at Pretoria inspected in 1904 and recommended, among much else, that a two-storey veranda should be wrapped around the three sides of the house that did not already have one, in ‘Aldershot/Bangalore’ style as the ambassador described it in 1989. These works were done, with £1,000 contribution from Imperial funds to supplement Colonial funds, during the years under the Transvaal government. The ground floor was adapted to office use in 1935, thereby squeezing the residence out of the building. The huge pressure for office space during the Second World War led to the rear kitchen block also being converted to offices. A small two-storey extension to the office building was completed in 1988, built by a Portuguese firm Sores da Costa, with most of its materials being imported by road from Pretoria. A clubhouse with swimming pool was completed in [?]. The address is now 310 Avenida Vladimir I Lenine. The consul-general first moved to a rent allowance property in 1935. A successor in 1942 leased a recently completed house at 118 Avenida Massano de Amorin as his residence. 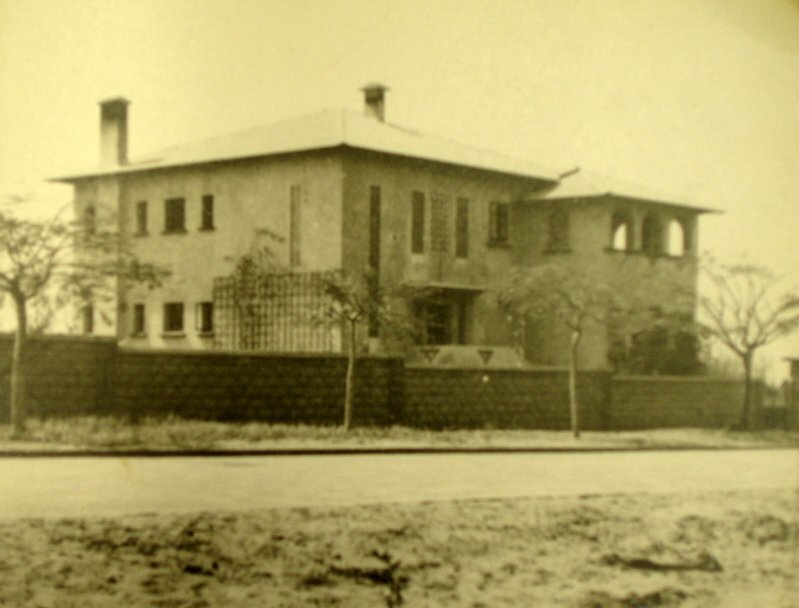 In 1948, there were plans to buy a site and build on it a residence designed by the Ministry of Works office in Cairo. To this end, a piece of land at 6 Avenida Massano de Amorin, at the junction with Rua Augusta Castilho, was bought for £4,500. But funds for this new building slipped out of reach and in 1951 the freehold of the leased house at 118 Avenida Massano de Amorin was instead bought from its owner, Mr Otto Barbosa da Silva, and the vacant site at No 6 in the same avenue sold to him in part exchange. The residence remains in this house, although the avenue is now called Mao Tse Tung. 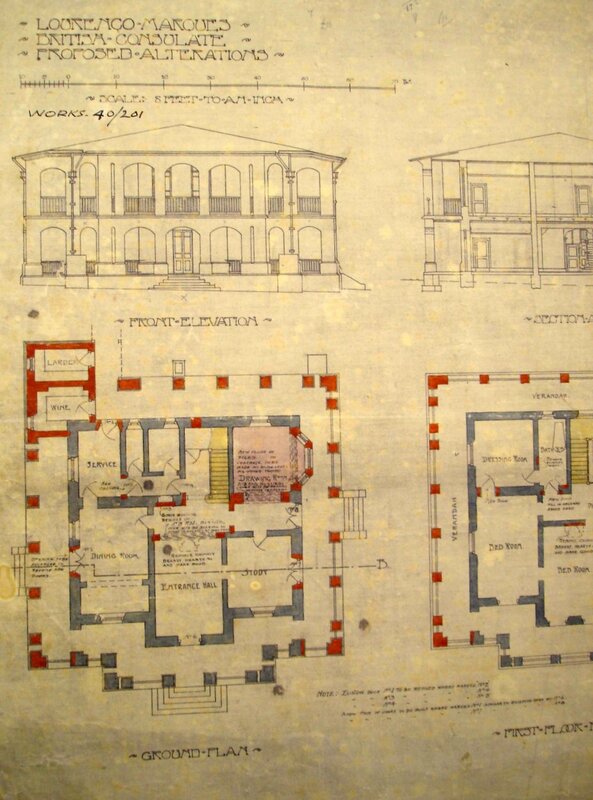 Ground floor plan of consulate house, with proposed new double-height verandas on three sides, 1906. Residence, while still being leased, 1950. 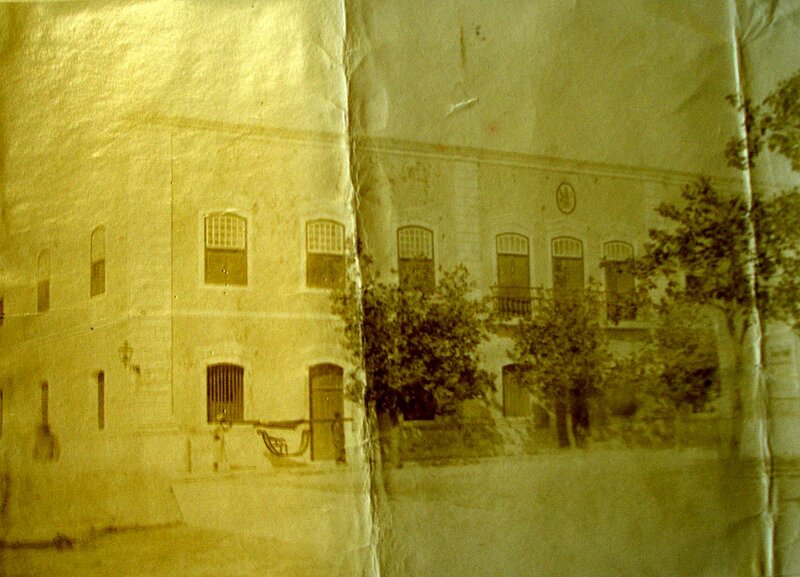 A vice-consulate was built in Beira in the 1890s, but it fell out of use and in the1930s the consular office and residence were leased on the first floor of the Casa Infante de Sagres building, a two-storey, terraced colonial block on Rua do Capito Pais Ramos. This accommodation was acceptable for offices but, reported a visitor, the ‘residential quarters cannot be too strongly condemned, with no Bath or Lavatory accommodation of any description beyond an impossible Earth Closet in the yard below’. By the end of the Second World War, consuls lived instead in the (not grand) Savoy Hotel. Plans for an improbably handsome new consul’s residence were drawn up by the Southern Rhodesia Public Works Department in 1944 and the intention in 1947 was to build it on the site of Stand 181, which was bought from the Mozambique Company for the purpose. The approval of the Portuguese government was tediously extracted from Lisbon, but the Treasury then withheld its own approval. 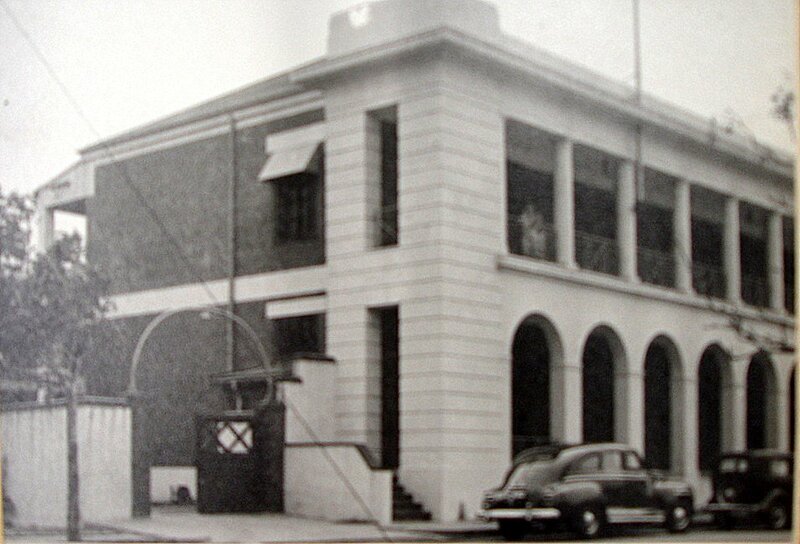 In 1949, Stand 489 was instead bought from Messrs Beira Works Ltd. for £14,000 and the recently completed house on it, formerly occupied by their chief engineer, became the consul’s residence. The address later became 48 Rua Francisco de Almeida. Stand 181 was sold in 1953. The vice-consulate closed in 1976 and the house was occupied on a caretaking basis by the British director of a freight company until the early-1990s. It was then leased to the Zimbabwean government, and sold to it in 1994 for £125,000. Leased offices and residence on the first floor of Casa Infante de Sagres, 1948.